This cool green hue gives all your fashion and beauty basics a refreshing twist. One of the best aspects of mint is that we can find one of the many tints that flatters our coloring. If the light mint washes you out, shoot for a darker mint green to bring out your features. Another benefit is that it blends well with so many colors. A hot color combo this spring is coral and mint together! Look for it. Keep your clothing in line with the latest fashion trends and start searching for those outstanding mint colored pieces! So, are you loving the mint trend? 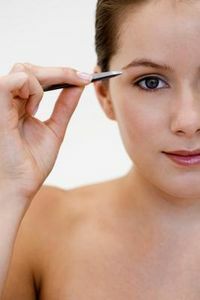 If you tweeze your eyebrows at home from time to time, you must be careful to not over-pluck those brows! You’ve probably seen these sorts of disasters before, and they are not pretty, nor are they easy to fix. It takes a lot of time to grow in new hair to replace the accidental ones you pulled out. How to pluck in moderation? Well, one great tip is to take a picture of your eyebrows before you begin attacking them with the tweezers. This way, you have an idea of how thick your eyebrows are to begin with, and you have a photo to turn to now and then as you tweeze and pluck away, to warn you when your eyebrows are hitting an unnatural thinness. Try to keep a shape very close to your natural eyebrow shape, only cleaner, if you will. This means, don’t try to alter the shape of your eyebrow, as it will distort your natural look. Imagine putting on lip liner up to your nose to make your lips appear larger. You’re not fooling anyone. Just as applying lip liner stays true to the shape of your mouth, only cleaner and more feminine, do the same with your eyebrows. Don’t try to create a trend with your eyebrows unless you are a professional. Trying to make your eyebrows taper into thin points on the outer eye or make them bold on either end but thin in the middle will most likely leave you screwing it up and plucking more than you wanted to, then having to keep on plucking to repair your beginner’s mistake. Stick to basic grooming, like getting rid of strays, and if you are unhappy with the results, pluck a few from the underside of your eyebrow. Overplucking of the brows can lead to a diminution in the size of the hair follicle, thereby making the new growing hairs smaller and finer as well. You’ll be frustrated if you get to this point. It probably goes without saying here, but if in doubt, see a professional! This is your face, after all and your eyebrows frame those beautiful eyes of yours. Make the most of them! While Belladerm can’t shape your eyebrows with laser hair removal, we CAN use a laser to remove the pesky unwanted hair between the brows. This can make a big difference in your appearance!